Sochi: Lewis Hamilton took full advantage of his Mercedes’ teammate Nico Rosberg’s mechanical misfortunes to seize a commanding victory in Sunday’s incident-filled Russian Grand Prix and take a massive lead in the title race. The defending two-time world champion started second on the grid, inherited the lead when Rosberg slowed and then retired, after seven laps, with throttle pedal problems and claimed his ninth win of the season and 42nd of his career with ease. That lifted the Briton up to 302 points in the world championship, with Sebastian Vettel, who took second in his Ferrari, now on 236 points, 66 adrift, with Rosberg now 73 points adrift on 229. If the cards fall in his favour, Hamilton can clinch the title in the next race in the United States on October 25. “I was excited because Nico and I were quite close together at the beginning. It was a shame for the team to lose one of the cars,” Hamilton said. 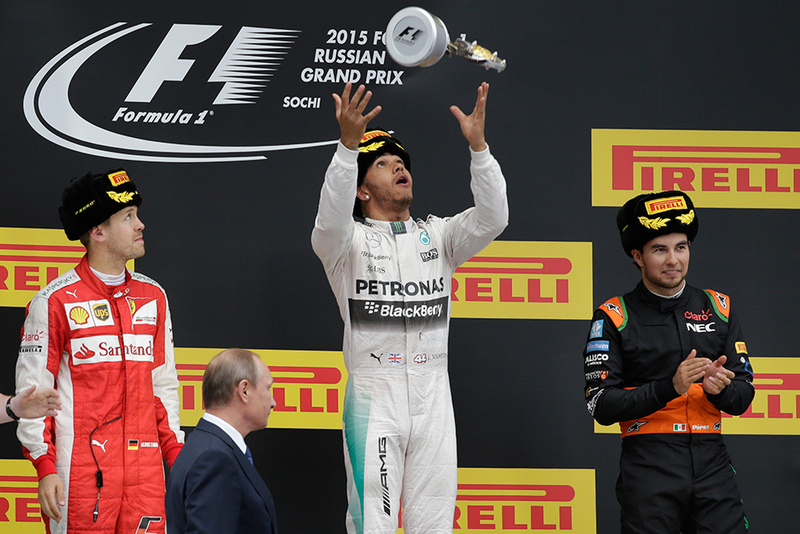 Despite his ill luck Rosberg refused to concede the title. “Formula One is pretty incredible sometimes, how tough it is,” he said. In a race with two Safety Car interventions, several accidents and a series of retirements, Spaniard Carlos Sainz who had crashed heavily in his Toro Rosso on Saturday, was passed fit to start from the back of the grid, rose to 10th and retired after spinning off in the closing laps. An opening lap multi-car collision caused the first Safety Car. The second came after 12 laps when Romain Grosjean crashed heavily in his Lotus and climbed out of the wreckage unhurt. Another crash on the final lap, involving Finns Kimi Raikkonen of Ferrari and Valtteri Bottas of Williams as they battled for third gave the position instead to Sergio Perez who claimed only the third podium in the Force India team’s history. “It just feels great to be back. One lap before the end it seemed like everything went away from us. I was very unhappy with myself but in the end I thought ‘I gave it all’. Felipe Massa secured some compensation for Williams by finishing fourth ahead of Raikkonen, local hero Russian Daniil Kvyat of Red Bull and Felipe Nasr of Sauber. Pastor Maldonado took eighth for Lotus and the two McLaren cars both claimed points with Jenson Button finishing ninth and Fernando Alonso 10th, having started on the back row of the grid. Vettel’s strong finish and Rosberg’s exit meant champions Mercedes were unable to wrap up another constructors title triumph at the Sochi Autodrom where Russian president Vladimir Putin arrived to take part in the post-race ceremonies.